if you're new around here, you may not know that i like to throw in an "eat" post every now & then. i loooove to eat, and i enjoy cooking, but i'm terrible at following recipes. i always second-guess stuff like, how much cilantro to add (the more the merrier) or how long cookies ought to bake ("i like when they're black on the bottom!"). it's just some funk-part of my brain that has an aversion to following rules. which also explains why i like to pay my water bill late, wear white shoes before easter, and run yellow lights without exception. orange lights are good, too. though i'm not a good recipe-follower, i can usually throw a bunch of stuff together & have it taste good. i know what flavors i like and generally know what tastes well together. today our refrigerator was almost entirely void of edible food. but i had some ground beef and found a bag of vegetables from our grandpa's garden that i had forgotten about. there were yellow potatoes and a gorgeous head of cabbage among other things. i knew i could make something out of these ingredients. i started to photograph each step, but i had no idea what i was going to make and figured i should probably just focus on the task at hand: lunch. 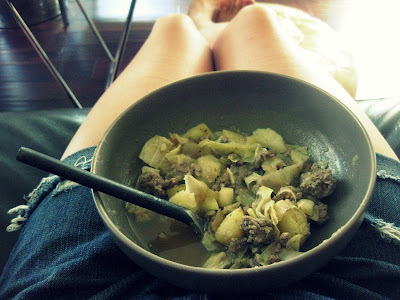 i chopped up the potatoes, and started boiling them while i cooked the ground beef with a bunch of minced garlic. then i chopped an onion and sauteed it in some olive oil. i chopped up the cabbage and added it to the onions once they started browning a bit. then i dumped a bunch of worcestershire sauce in the pan and let the onions and cabbage simmer for a bit. when the potatoes were done, i dumped the water and combined the ground beef, onions, and cabbage into the pot. it was so thick and crazy so i added chicken broth and let it all simmer over low heat. i added some thyme and marjoram, salt & pepper. and....it was delicious!!! definitely not gourmet, but good comfort-food. a grab 'n dump success. 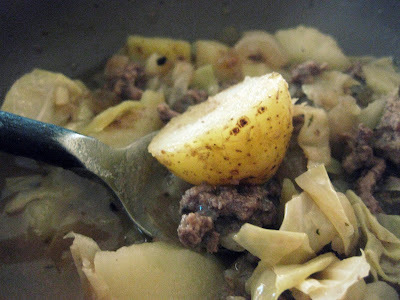 6. add ground beef, cabbage & onions to the potato pot.